Wolfson’s students ask what we can learn about the Renaissance court through art, architecture and material objects. In Part I, Sharon Ardley and Victoria Mitchell wrote about Marcus Gheeraerts the Younger’s Queen Elizabeth I also known as ‘The Ditchley portrait’ (their post can be found here: https://blogs.canterbury.ac.uk/humanities/power-splendour-and-diplomacy-understanding-the-early-modern-royal-court-through-objects-part-i/). In Part II, Edward Shooter undertakes architectural and diplomatic analysis of the Banqueting House at Whitehall. In 1619 James I tasked Inigo Jones, a famous architect and set designer, to design the new Banqueting House in London, following a fire which began as work was carried out to repair masque sets in 1606 that destroyed the refurbished building. The construction was perfectly proportioned at 110 feet long, 55 feet high and 55 feet wide. The exterior was covered in white Portland Stone, an impressive sight in an overcrowded London, costing a tremendous £712 19s. 2d, which today equates to £68,444.00, rising the overall cost of the Banqueting House to £15,940 4s. 1d, around £1.5 million. The Banqueting House became the magnificent setting James desired for his masque performances. Ben Jonson’s Masque of Augurs was the first masque performed in the renovated Banqueting House on 6 January 1622 accompanied by Jones’s spectacular scenery design to highlight the architectural delight of the Banqueting House. Sir Peter Paul Rubens added to the magnificence of the Banqueting House, under the reign of Charles I, with an installation of a nine-piece display of artwork across the ceiling. The main (middle) three pieces depict: ‘The Union of the Crowns’, ‘The Apotheosis of James I’ and ‘The Peaceful Reign of James I’. Following the installation of the artwork, Charles commissioned the building of a separate and purposeful Masquing House, thereby removing the masque performances from the Banqueting Hall, for fear of damaging the paintings with the smoke from the candle lit masques. Sir William Davenant’s Temple of Love was the last performed masque in the Banqueting House because of Charles’s commission of the new wooden house or its less formal name, the Queen’s dancing barn. This protection of the interior design of the Banqueting House arguably resulted in the building losing one of its key features – the identification of the Stuart masque with the splendour and majesty of the Banqueting House. Interestingly, this artwork was among the final things Charles saw before climbing out of the window onto the scaffolding outside of the Banqueting House to be executed as a ‘Tyrant, Traitor, Murder’, on 30 January 1649. 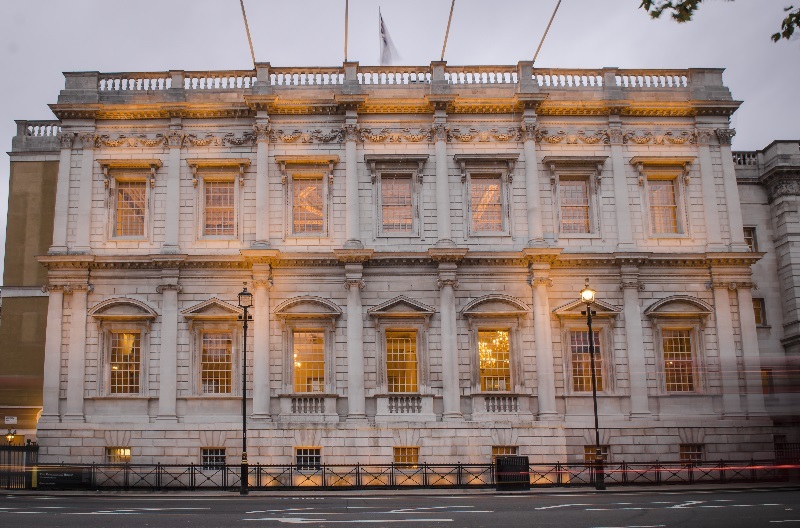 The Banqueting House’s continued association with power and sovereignty remained significant throughout the civil wars and Interregnum, with Oliver Cromwell receiving ambassadors within this building, so closely associated with the power of the Stuart monarchy. Overall, it is clear that the Banqueting House was utilised by the state in a variety of ways: for masques under the Stuarts; by parliament as the army headquarters during the Wars of the Three Kingdoms (1639-51); as a fitting back drop for a king’s death; and as a place of power and rule during the Interregnum. The Banqueting House is now open for viewing by the general public.